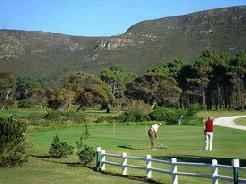 The Durbanville Golf Club began in 1971 is located in the Northern Suburbs of Cape Town, just a 30 km drive or 25 minutes from Cape Town on the N1 freeway. 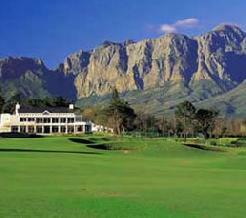 A relatively new course established to meet the growing population in the northern suburbs of Cape Town, it has blossomed into an attractive and popular golfing venue. There are no steep hills to climb, nor thick jungle to swallow your golf ball. Here you will find open space with beautiful fairways, bent grass greens the equal of any others - a course in immaculate condition. All in all, a wonderful setting for a game of golf with a view across the course to the distant mountains from the lounge bar, where you may enjoy a tipple at the 19th hole after your game. 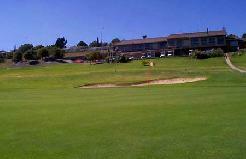 It is a very pleasant, easy walking course to play. The Club offers a special welcome to all visitors and has built up a reputation as one of the friendliest clubs around. The halfway house and catering facility offers freshly prepared snack style food combining quality and value for money. Signature hole: is the 12th Hole -Par 3 - 149 metres. 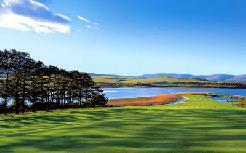 Catch your breath and enjoy the view over the dam before playing this tricky par 3. The tee, situated on the dam wall, sits between willow trees and the reeds fronting it. Your shot is to a green left of the dam, with any slice, push or fade guaranteed to result in your ball finding a watery grave. Too short a shot will see a steep bank rolling your ball back to the water. A large flat bunker. to the left of the green may catch the less than sure, but safe, shot.